GreenPois0n RC5 allows you to easily jailbreak an iPad running iOS 4.2.1, the main advantage to GreenPois0n is that it provides a completely untethered jailbreak solution that can be initiated from both Mac OS X and Windows. This guide will walk you through the process of jailbreaking an iPad with iOS 4.2.1 software. Before you start, make sure you have backed up your iPad. Remember, the “Sleep” button is the button on top of your iPad, and “Home” is the button on the lower part of the screen. That’s it! Your iPad is now jailbroken and untethered! You can read this to understand the difference between a tethered and untethered jailbreak, but in short an untethered jailbreak is what you want out of convenience. Loader app fails to load Cydia – this often means the remote servers are overloaded, often simply waiting or trying again resolves the problem. Some people say that rebooting the iPad can help, but I think it’s placebo while the servers have time to recover. Loader is crashing, Cydia still won’t load – if all else fails, you can actually run Redsn0w 0.9.7b6 on top of your GreenPois0n jailbreak, the key is that you want to select only to “Install Cydia” from redsn0w, and not to go through the jailbreak process again. Remember that this jailbreak is reversible, you can easily unjailbreak the iPad by simply using the “Restore” option from iTunes. These are iPad specific instructions, but you’ll find that using GreenPois0n with the iPhone and iPod touch running iOS 4.2.1 is very similar. How do I go from a tethered to untethered jailbreak? Do I have to unjailbreak it first? Stephen, if your iPad is already on iOS 4.2.1 and jailbroken with redsn0w you can run GreenPois0n on top of it to untether the jailbreak. if im having ipad iOS 3.2.2 do i have to upgrade to iOS 4.2.1 and then run untethered jailbreak? 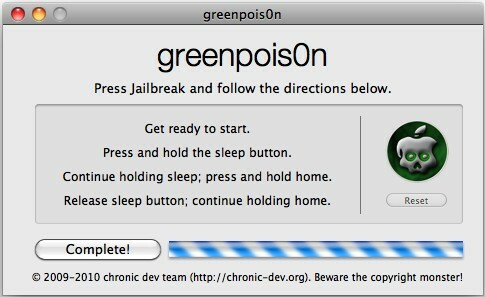 or if im having ipad iOS 4.2.1 just then i can run greenpois0n jailbreak without installing any other software? Thank you Matt! Works great. Just you inform you guys that i just JB my ipad with the latest Greenp0ison rc5 on my previously redsn0w-jailbroken ipad 4.2.1. It went through the 1st attempt. I did not restore to its original settings as it would mean all my apps gone. Everything seems ok till now, just that i noticed that the wi-fi is kind of unstable. (keeps on and off by itself). I try rebooting my ipad and my wifi router. It helped. Hope it won’t happen again. Same to me. I need to restore that . There r some crash. i jailbroke my ipad doing this method and after it i had a red line down my screen how do i fix this?? i have jailbreak my ipad but the loader won’t show up. i’m using windows btw. after jailbreaking, my ipad cannot connect to itunes store anymore until i signed in with another account. And it still charges me for the applications i downloaded…anyone please help!!? Does it delete all youre apps and photos?? This worked great still. Thanks a ton for the awesome and easy jailbreak.